Several years ago, some friends and I came upon a kilt-maker at a street fair in Stratford, Ontario. He made his kilts on a solar-powered sewing machine. One of the models he offered was a kilt made of hemp. He said that he was almost certain that at that moment in time, he was the only person in the world making kilts out of hemp. He was probably right. I remember thinking how very few things we could say that about — that we are the only person in the world doing that thing. But maybe it just depends on how specific we get. 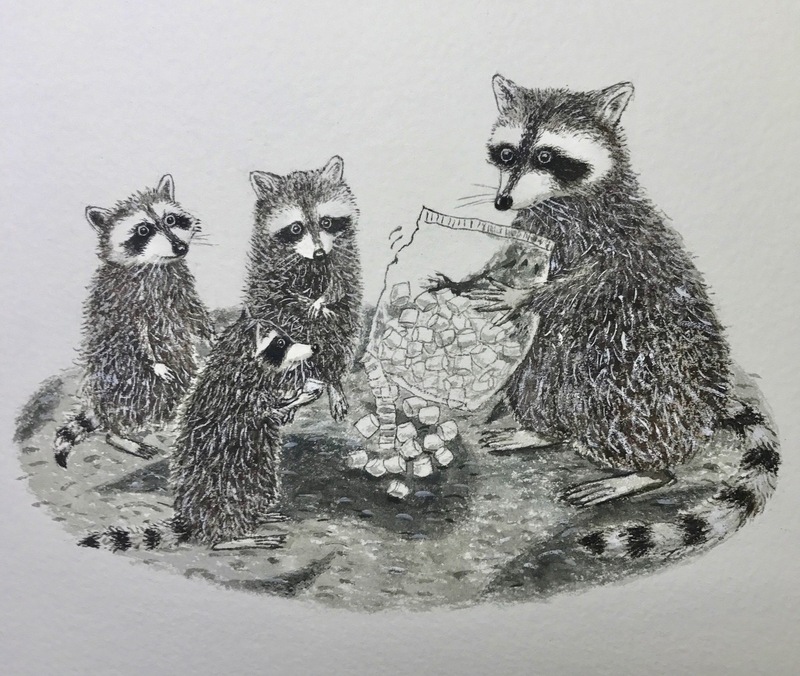 This morning, I finished this illustration of raccoons eating a bag of mints on the carpet of the clubhouse of an abandoned golf course, and I thought to myself, I bet I am the only person who has ever made a drawing of this particular subject. The drawing is for a chapter book that will be out next year. It’s not about raccoons, it’s about sisters. I have about a zillion drawings (okay, maybe 2 dozen) to make in the next couple of weeks. Wish me luck.